With two weeks to go until Christmas Eve, lawyers, law students and law-enthusiasts everywhere may be despairing at the lack of law-related Christmas tree decorations available for purchase on the high street. If you wish to add some legal flair to your seasonal spruce, look no further than the Supreme Court gift shop, where you can purchase fabric decorations bearing the emblem of the Supreme Court (see picture). 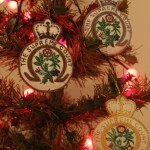 These have been released for Christmas 2012 following the success of the Supreme Court baubles first sold last year (see this post, where we also give you an idea of potential Supreme Court stocking fillers). The fabric decorations cost £10 each or £25 for a set of three, and the baubles cost £12 each. All the decorations, gifts and a selection of Christmas cards (the most popular being one featuring a picture of the Supreme Court justices) are available for sale by the Supreme Court café from 9.30am to 4.30pm on Monday to Friday. The sale of souvenirs helps fund the running of the Supreme Court (see this link for further details). Leave a reply on "Have Yourself A Supreme Court Christmas"